Expected Release: Q2 2019. Date subject to change. The King's Landing cycle takes a new approach to the Game of Thrones LCG. Rather than following the plot of A Song of Ice and Fire, this cycle is centered around the capital of the seven kingdoms, allowing you to explore the world of Westeros more freely than ever before. Every Chapter Pack in this cycle features three copies each of twenty unique cards to strengthen your decks and help you embrace the deadly intrigues of A Song of Ice and Fire with the continued cultivation of the shadow keyword, first reintroduced in the Dance of Shadows cycle. 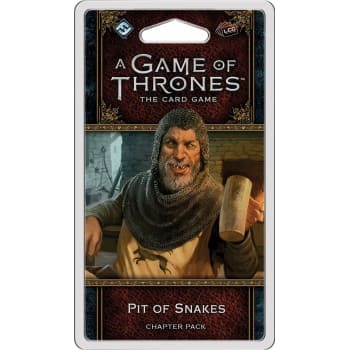 Pit of Snakes takes you to the heart of King's Landing, where wise Maesters, noble Lords, and cunning Ladies spin their intrigues in pursuit of power. Featuring new versions of key characters and a variety of cards to help you build a deck around The Seven trait, this Chapter Pack provides you with the tools you need to take your battles in Westeros to the next level. But be wary-the more power you gain, the more of a target you become.